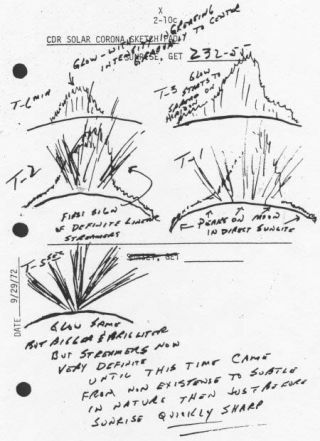 Dusty "twilight rays" sketched by Apollo 17 astronauts in 1972. Every lunarmorning, when the sun first peeks over the dusty soil of the moon after twoweeks of frigid lunar night, a strange storm stirs the surface. The next timeyou see the moon, trace your finger along the terminator, the dividing linebetween lunar night and day. That's where the storm is. It's a long and skinnydust storm, stretching all the way from the north poleto the south pole, swirling across the surface, following the terminator assunrise ceaselessly sweeps around the moon. Never heard ofit? Few have. But scientists are increasingly confident that the storm is real. The evidencecomes from an old Apollo experiment called LEAM, short for Lunar Ejecta and Meteorites. "Apollo 17 astronauts installedLEAM on the moon in 1972," explains Timothy Stubbs of the Solar SystemExploration Division at NASA's Goddard Space Flight Center. "It wasdesigned to look for dust kicked up by small meteoroids hitting the moon'ssurface." Billions ofyears ago, meteoroids hit the moon almost constantly, pulverizing rocks andcoating the moon's surface with their dusty debris. Indeed, this is the reasonwhy the moon is so dusty. Today these impacts happen less often, but they stillhappen. Apollo-erascientists wanted to know, how much dust is ejected by daily impacts? And whatare the properties of that dust? LEAM was to answer these questions using threesensors that could record the speed, energy, and direction of tiny particles:one each pointing up, east, and west. "Toeveryone's surprise," says Olhoeft, "LEAMsaw a large number of particles every morning, mostly coming from the east orwest--rather than above or below--and mostly slower than speeds expected forlunar ejecta." Whatcould cause this? Stubbs has an idea: "The dayside of the moon ispositively charged; the nightside is negativelycharged." At the interface between night and day, he explains, "electrostatically charged dust would be pushed across theterminator sideways," by horizontal electric fields. Even moresurprising, Olhoeft continues, a few hours afterevery lunar sunrise, the experiment's temperature rocketed so high--near thatof boiling water--that "LEAM had to be turned offbecause it was overheating." Those strangeobservations could mean that "electrically-charged moondustwas sticking to LEAM, darkening its surface so the experiment package absorbedrather than reflected sunlight," speculates Olhoeft. But nobodyknows for sure. LEAM operated for a very short time: only 620 hours of datawere gathered during the icy lunar night and a mere 150 hours of data from theblazing lunar day before its sensors were turned off and the Apollo programended. Astronauts mayhave seen the storms, too. While orbiting the Moon, the crews of Apollo 8, 10,12, and 17 sketched "bands" or "twilight rays" wheresunlight was apparently filtering through dust above the moon's surface. Thishappened before each lunar sunrise and just after each lunar sunset. NASA'sSurveyor spacecraft also photographed twilight "horizon glows," muchlike what the astronauts saw. It's evenpossible that these storms have been spotted from Earth: For centuries, therehave been reports of strange glowing lights on the moon, known as "lunartransient phenomena" or LTPs. Some LTPs have been observed as momentary flashes--now generallyaccepted to be visible evidence of meteoroids impacting the lunar surface. Butothers have appeared as amorphous reddish or whitish glows or even as duskyhazy regions that change shape or disappear over seconds or minutes. Earlyexplanations, never satisfactory, ranged from volcanic gases to observers'overactive imaginations (including visiting extraterrestrials). Now a newscientific explanation is gaining traction. "It may be that LTPs are caused by sunlight reflecting off rising plumes ofelectrostatically lofted lunar dust," Olhoeft suggests. All thismatters to NASA because, by 2018 or so, astronauts are returning to the Moon.Unlike Apollo astronauts, who never experienced lunar sunrise, the nextexplorers are going to establish a permanent outpost. They'll be there in themorning when the storm sweeps by. The wall ofdust, if it exists, might be diaphanous, invisible, harmless.Or it could be a real problem, clogging spacesuits, coating surfaces andcausing hardware to overheat. Which will itbe? Says Stubbs, "we've still got a lot to learnabout the Moon."